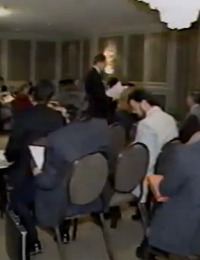 On February 25, 1987, a Select Committee looking at the Retail Business Holidays Act (after the Act survived a Charter challenge in the Supreme Court of Canada, in December of 1986) held a hearing in London, Ontario. Freedom Party of Ontario Action Director testified to the committee in his capacity as a book store owner (City Lights Book Store), and Freedom Party president Robert Metz appeared on behalf of Freedom Party of Ontario. The Chair of the committee was happy finally to hear from people who were opposed to the ban: he was sure that the general public opposed the ban too. Featuring: Robert Metz (Leader, Freedom Party of Ontario), Marc Emery (Freedom Party Action Director)…and if you look closely, Lloyd Walker is seen in the audience.